Idiopathic pulmonary lung fibrosis (IPF) is a fatal disorder in which the lungs become scarred and fibrotic, preventing proper function. There are no effective treatments for this disease, and the factors that drive IPF are poorly understood. Myofibroblasts mediate fibrosis in many tissue types and are generated in response to both TGF-β signaling and mechanical signals such as matrix stiffness; however, is not clear how these cells sense and transmit mechanical signals. Shaik Rahaman and colleagues at the Cleveland Clinic demonstrated that the transient receptor potential vanilloid 4 (TRPV4) channel mediates mechanical signals that trigger myofibroblast differentiation. Lung fibrobalsts from IPF patients had increased TRPV4 activity compared to those from healthy subjects, and plating human lung fibroblasts on stiff matrices or fibrotic lung tissue enhanced TRPV4 channel activity. Mice lacking TRPV4 were resistant to chemical-induced fibrosis, and pharmacological inhibition of TRPV4 prevented myofibroblast generation. Together, these data reveal that mechanical stress-dependent modulation of TRPV4 activity mediates myofibroblast differentiation and suggest TRPV4 inhibition as potential therapeutic strategy for IPF. 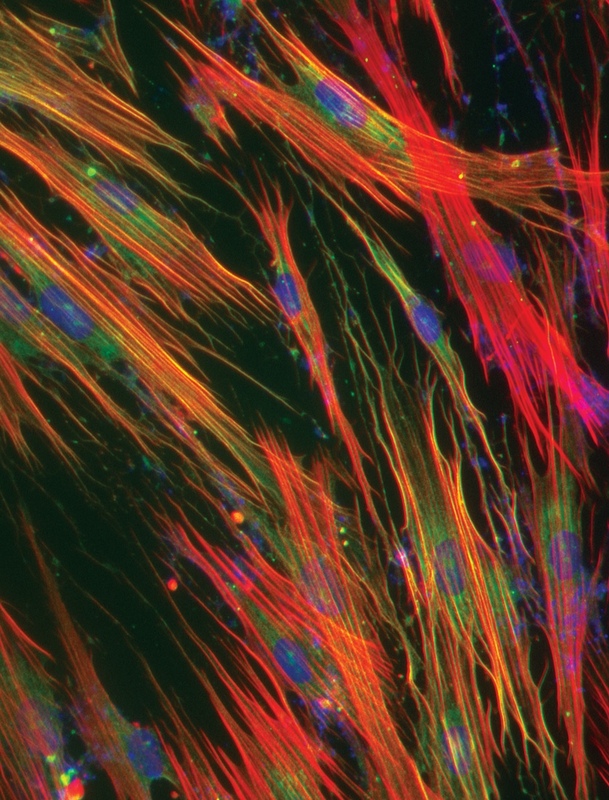 The accompanying image shows the TGF-β–induced differentiation of human lung fibroblasts into myofibroblasts, as evidenced by smooth muscle actin (green) and cytoskeletal remodeling (F-actin, red). Nuclei stained blue with DAPI. Citation Information: J Clin Invest. 2014;124(12):5225-5238. https://doi.org/10.1172/JCI75331. Idiopathic pulmonary fibrosis (IPF) is a fatal fibrotic lung disorder with no effective medical treatments available. The generation of myofibroblasts, which are critical for fibrogenesis, requires both a mechanical signal and activated TGF-β; however, it is not clear how fibroblasts sense and transmit the mechanical signal(s) that promote differentiation into myofibroblasts. As transient receptor potential vanilloid 4 (TRPV4) channels are activated in response to changes in plasma membrane stretch/matrix stiffness, we investigated whether TRPV4 contributes to generation of myofibroblasts and/or experimental lung fibrosis. We determined that TRPV4 activity is upregulated in lung fibroblasts derived from patients with IPF. Moreover, TRPV4-deficient mice were protected from fibrosis. Furthermore, genetic ablation or pharmacological inhibition of TRPV4 function abrogated myofibroblast differentiation, which was restored by TRPV4 reintroduction. TRPV4 channel activity was elevated when cells were plated on matrices of increasing stiffness or on fibrotic lung tissue, and matrix stiffness–dependent myofibroblast differentiation was reduced in response to TRVP4 inhibition. TRPV4 activity modulated TGF-β1–dependent actions in a SMAD-independent manner, enhanced actomyosin remodeling, and increased nuclear translocation of the α-SMA transcription coactivator (MRTF-A). Together, these data indicate that TRPV4 activity mediates pulmonary fibrogenesis and suggest that manipulation of TRPV4 channel activity has potential as a therapeutic approach for fibrotic diseases.